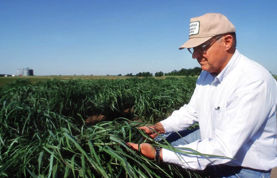 Switchgrass can yield almost twice as much ethanol as corn, estimates geneticist Ken Vogel (above), who is conducting breeding and genetics research on switchgrass to improve its biomass yield and its ability to recycle carbon as a renewable energy crop. Interest in ethanol remains high despite a drop in conventional energy prices, with ethanol production breaking records, and a great deal of work being focused on cellulosic ethanol. Included in this was the Biorefinery Initiative. The idea behind the initiative is to achieve greater use of "homegrown" renewable fuels in the United States, an example being perfecting the advanced technologies needed to make fuel ethanol from cellulosic (plant fiber) biomass, which is now discarded as waste. In his State of the Union Address this year, President Bush has followed up with additional alternative energy initiatives. The beginning of 2007 finds that benchmark energy prices--notably oil prices, which hit close to $77 a barrel this past summer--dropping from almost historical highs. But lower energy prices seem to have done little to reduce the high interest and investment in ethanol facilities in the United States. Each month seems to see a flurry of announcements of new ethanol plants, with investment capital coming from everyone from Bill Gates to Virgin Airways' Richard Branson. The burgeoning alternative energy sector got a big boost during the year from Cilion Inc., an ethanol producer that is a partnership between Western Milling and venture capital firm Khosla Ventures. Cilion raised $209 million and was the top-grossing venture capital deal of the third quarter. Vinod Khosla of Khosla Ventures earned a fortune as a venture capitalist in Silicon Valley--he was one of the founders of Sun Microsystems. Khosla is now investing heavily in biofuels--and has said that the potential of ethanol reminds him of the potential he saw with the Internet. Some industry experts have said that the high interest clearly illustrates that ethanol is becoming a permanent part of the energy picture in the U.S. rather than simply a fad. Further evidence of this came when retail giant Wal-Mart announced that it was considering offering 85 percent ethanol (E85) at nearly 400 Sam's Club and Wal-Mart stores nationwide. Industry numbers illustrate the growth in ethanol production. The Renewable Fuels Association (RFA), the national trade association representing the U.S. ethanol industry, said that U.S. ethanol production increased in October 2006 to 330,000 barrels per day, matching the all-time high set in September 2006. Industry estimates show ethanol production reaching 4.9 billion gallons for the year, an increase of more than 25 percent from 2005. "The U.S. ethanol industry has responded to the challenges of the President, the American public and the marketplace to increase the supply and availability of this cleaner-burning fuel," said RFA president Bob Dinneen. 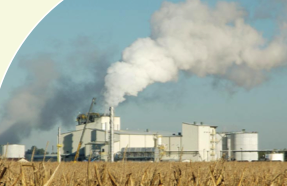 Currently, 101 ethanol biorefineries nationwide have the capacity to produce more than 4.7 billion gallons annually, according to the RFA. There are 42 ethanol refineries and seven expansions under construction with a combined annual capacity of nearly 2.9 billion gallons. In the United States, there are now more than 100 ethanol biorefineries that have the capacity to produce more than 4.9 gallons annually, according to the Renewable Fuels Association. Plant expansions and new plant construction are expected to move that production figure up substantially. One state alone, Iowa, is nearing the two billion-gallon milestone for fuel ethanol capacity. Iowa is now the country's leading ethanol producer and has 29 plants in operation, expansion or under construction, with 1.945 billion gallons of ethanol capacity. In a presentation to a Senate Committee in 2006, Dinneen termed the growth of the industry as "unprecedented." He noted, "Ethanol has become a ubiquitous component of the U.S. motor fuel market. Today, ethanol is blended in more than 40 percent of the nation's fuel and is sold virtually from coast to coast." That level of ethanol production requires a lot of feedstock. In 2005, the U.S. ethanol industry consumed more than 1.4 billion bushels of corn in the production of four billion gallons of ethanol. The four billion gallons of ethanol produced and sold in the U.S. in 2005 contributed significantly to the nation's economic, environmental and energy security. According to an analysis completed for the RFA, the four billion gallons of ethanol reduced oil imports by 170 million barrels of oil, valued at $8.7 billion. "In large part because of the Energy Policy Act of 2005 (EPAct), the U.S. ethanol industry is today the fastest growing energy resource in the world," said Dinneen, in his Senate presentation. The EPAct requires refiners to utilize an increasing percentage of renewable fuels. The Renewable Fuels Standard (RFS) began in January 2006 and required refiners to utilize at least four billion gallons of ethanol and/or biodiesel in 2005. The RFS gradually increases to at least 7.5 billion gallons of renewable fuels by 2012. "The RFS has been a clarion call to the ethanol industry and the financial community, that demand for ethanol and biodiesel was no longer uncertain, allowing the renewable fuels industry to grow with confidence," added Dinneen. at biorefineries across the country, he said. Plants are using innovations such as no-heat fermentation, corn fractionization and corn oil extraction. They are also looking toward new energy sources, including methane digesters and biomass gasification. "In short, the ethanol industry is unrecognizable from what it was just five years ago, and it will be unrecognizable again five years from now." To date, Dinneen noted, the ethanol industry has grown almost exclusively from grain processing. In the future, ethanol will be produced from other feedstocks, such as cellulose. However, it is more difficult to break down cellulose and convert it into usable sugars for ethanol. But making ethanol from cellulose dramatically expands the types and amount of available material for ethanol production. "This includes many materials now regarded as wastes requiring disposal, as well as corn stalks, rice straw and wood chips or 'energy crops' of fast-growing trees and grasses. Cellulosic ethanol production will augment, not replace, grain-based ethanol, but ultimately exponentially expand potential ethanol supplies." Dinneen said that a number of companies are working to commercialize cellulosic ethanol. Iogen, Inc., a Canadian enzyme company, has been producing cellulosic ethanol from wheat straw since 2004 at a one million-gallon plant in Ontario. The company is planning to begin construction of a commercial facility in the U.S. during the summer of 2007. Abengoa Bioenergy Corp. has begun construction of a grain and cellulose ethanol plant in Spain. The company plans to bring that technology to the U.S. as soon as the technology is proven successful. "Numerous other companies are moving toward commercialization, and I am confident cellulosic ethanol will be a reality quite soon," said Dinneen. In a separate presentation, Chris Standlee, executive vice-president of Abengoa Bioenergy, outlined cellulosic ethanol's present and future to the Senate Committee on Energy and Natural Resources. Abengoa owns and operates ethanol production plants in the United States and Europe. In the U.S. it owns and operates three plants, with a fourth under construction: one in New Mexico, two in Nebraska, and one in Kansas. Standlee talked about the world's first commercial demonstration cellulosic ethanol plant, which the company is building in Salamanca, Spain. "This plant should provide significant insight into efficiencies and technologies for biomass ethanol production that we can incorporate into a new cellulosic plant here in the U.S.," he said. "Abengoa is committed to making the cellulosic industry work in the U.S."
The company has committed to investing significant resources to produce biomass ethanol at a cost competitive price with gasoline, as well as the Department of Energy's goal of producing 60 billion gallons of ethanol from cellulose by 2030. "Abengoa believes in the future of cellulosic ethanol and is committed to that future," said Standlee. The cornerstones of Abengoa's efforts are the two biomass ethanol facilities. "Our goal is to enable the commercialization of the technology by 2011. The engineering and research pilot plant facility in York, Nebraska will demonstrate our new biomass fractionation and fermentation technology. The biomass demonstration facility being constructed by the company in Spain will demonstrate the enzymatic hydrolysis technology at the commercial scale. This facility will use wheat straw as the primary feedstock and will have the capacity to produce approximately two million gallons of ethanol annually. The knowledge gained and lessons learned from these two facilities will be the basis for the design of the company's first commercial scale biomass ethanol facility which will be located in the U.S. grain belt. The technological revolution happening at biorefineries and every ethanol construction site across the country is astonishing, said Standlee. Technology is moving ahead at a very rapid pace for the companies that are conducting the research, and it is vital to the future of the renewable industry. Because it plays such an important role, Standlee noted that Abengoa has committed over $100 million to be spent over the next four years on research towards making cellulosic ethanol more practical and feasible. In 2003, Abengoa was awarded a $35 million cost share project by the DOE to improve efficiencies of traditional ethanol production from grains, and to evaluate and develop new biomass ethanol technologies. With the DOE grant, the company was able to form partnerships and look into new ventures with companies like Nature Works to develop a new pentose fermenting yeast, essential for the biomass technology, said Standlee. "In addition, we have partnerships with several other companies that will assist in the development of ethanol synthesis technology." 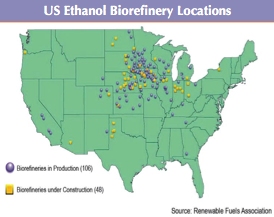 "The cellulose ethanol industry will develop in the Midwest around the existing starch ethanol industry, but biomass exists in vast quantities everywhere, and we expect significant geographical expansion after it is initially established. As documented by the USDA, there is sufficient biomass resources to make over 50 billion gallons per year of ethanol, in addition to traditional fermentation gallons." After construction of a full commercial scale cellulosic ethanol facility, Abnegoa's deployment plan calls for the addition of cellulosic biomass processing capacity to its existing production facilities in both the U.S. and Europe. The company's plan also calls for the geographical expansion of ethanol by constructing greenfield cellulosic biomass facilities in the eastern and western parts of the U.S., where biomass is abundant. Abengoa also intends to license its technology to qualified partners to further expand biomass technology. With incentives, biomass ethanol could quickly grow to 20 or 30 billion gallons of production in the mid-term, replacing a significant amount of the imported oil needs of the U.S. and approaching DOE's goal of 60 million gallons. "While biomass ethanol is competitive with oil even as low as $50 per barrel, the industry needs incentives to insure growth and to protect against the possibility that oil prices could temporarily dip below $50 per barrel." Without these incentives, Standlee said, private new technologies and unproven plant designs are difficult to finance. "One of the main obstacles facing a new industry is securing capital from the financial markets to invest in the physical infrastructure needed to determine what technology works in the plant. Financial markets look for signals from the federal government to show that it is serious about developing a new industry." In his presentation, Standlee referred to President Bush's acknowledgement that the nation "is addicted to oil" and pledged to greatly reduce the country's oil imports by increasing the production and use of domestic renewable fuels such as ethanol and biodiesel.